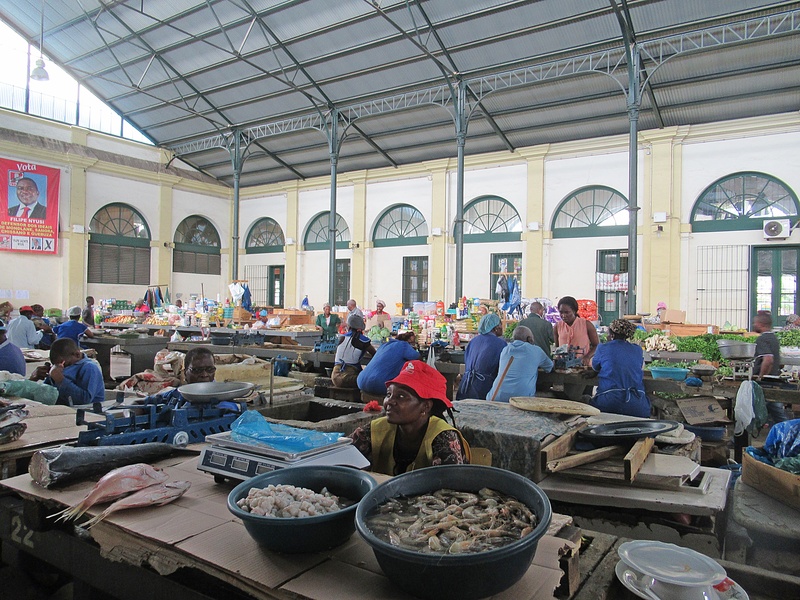 After a few days in Maputo, I wondered if a month would be too much time in Mozambique. I’ve felt like that about other places in my travels, only to shed a tear when it was time to leave. Maputo isn’t an easy city. There are challenges – sketchy public transportation and infrastructure, poor signage, a significant language barrier, and humid tropical weather. 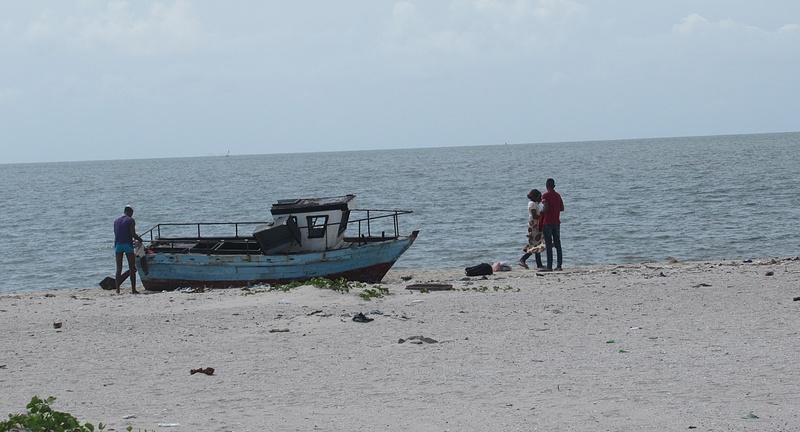 Adjusting is difficult, but Mozambique is worth the effort. It’s exciting to get out of your comfort zone and see life from another perspective. Still, it takes several days to acclimate and find your way around a new city. In a month, there’s time to get comfortable with the environment and dig deeper. Each day brings a better understanding of a new culture but getting around has been challenging. Most Maputo taxi drivers don’t speak English and communication is difficult. They can misunderstand your destination unless it’s a well-known place or you have a card with the printed address. Many are illiterate and cannot read. Buses packed like sardines are potentially dangerous, not to mention learning the sketchy pickup and drop-off points. 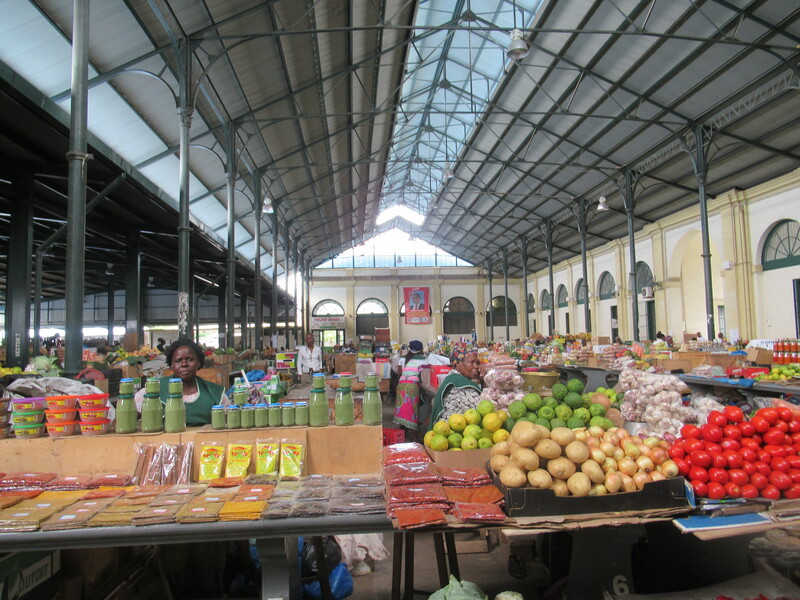 For the past few days, I’ve explored the city concentrating on major attractions in central Maputo. Different guides have taught me about local culture and history. 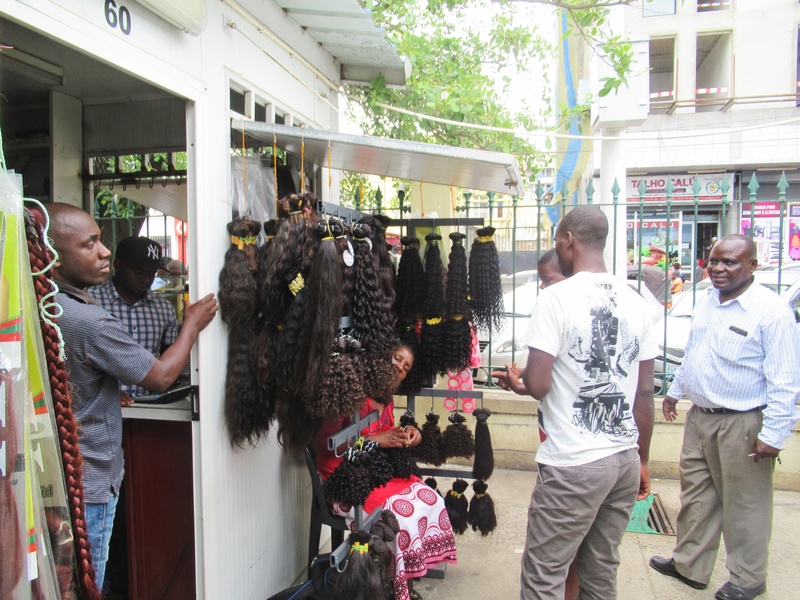 Some have picked my brain about difficulties experienced as a tourist in Maputo. 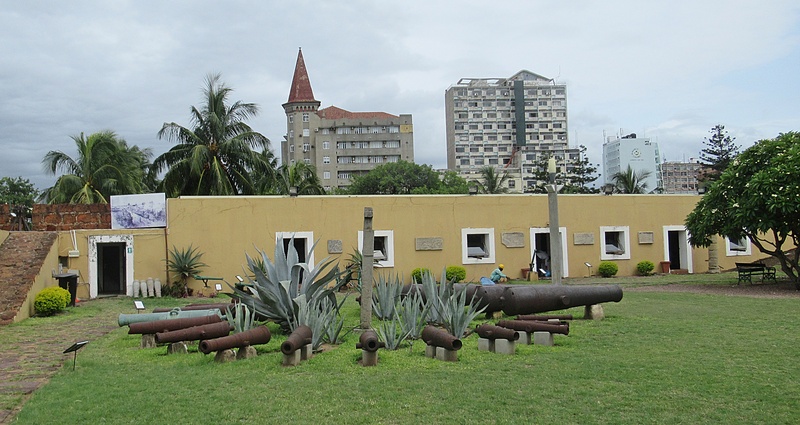 One local group – Maputo a Pé – is knowledgeable and well-connected with local clubs and expat organizations like the French and American cultural centers and the Club of Mozambique. Their office is in the information center near the entrance to Tunduru Botanical Gardens. I’ve appreciated their help and plan to go on an “art safari” and barrio walks to learn more about Mozambique. 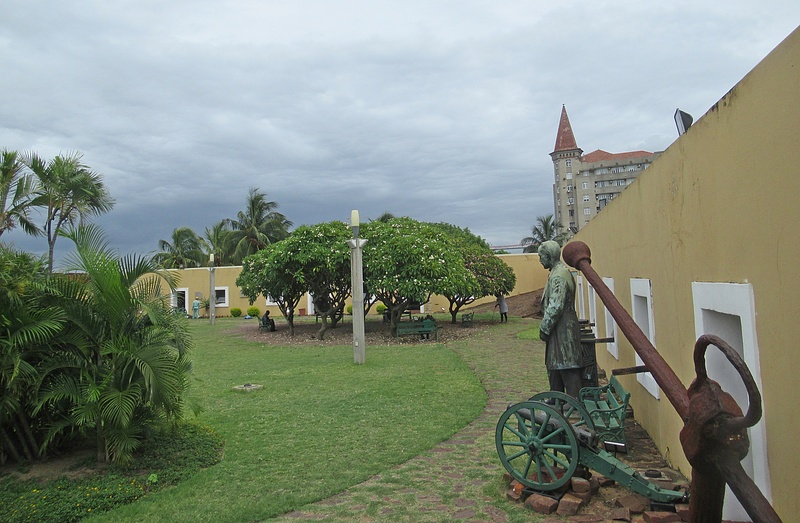 One of my guides – Hendy Mario of Maputo Free Walking Tour – specializes in Maputo’s historical sites. Hendy is Mozambican. His wife is from Georgia USA. Hendy grew up on the Island of Mozambique, a remote fishing village on a “crescent-shaped coral island” in northern Mozambique. The island is noted for its mixture of European, Arabic, and Indian cultures. For centuries it was a Portuguese trading post on the route to India and considered the “capital and trading centre of Portuguese East Africa“. Hendy’s tour was set up like those I enjoyed in Prague. You aren’t obliged to pay a set fee. Instead, you pay the guide what the tour was worth to you. I learned much from Hendy and thought my time was well spent. We walked the central area where he pointed out notable buildings and talked about their history. 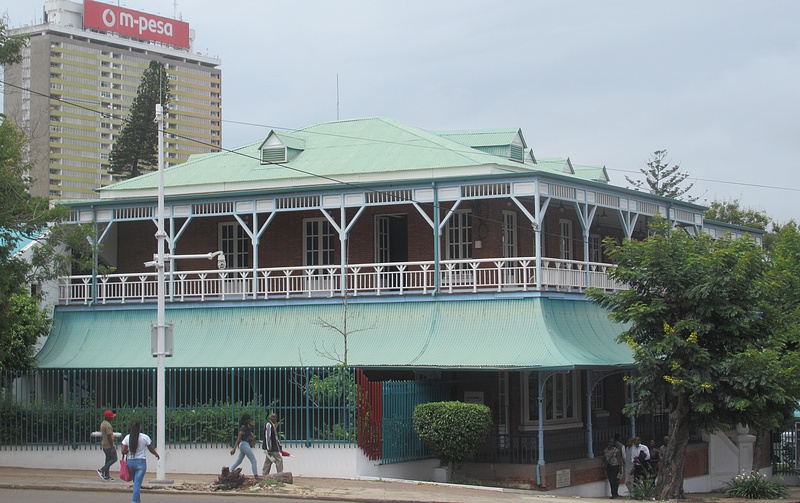 Many of them are described in Phillip Schauer’s book Maputo Architectural and Tourist Guide, a valuable reference when the dull brain fails. Hendy’s tours concentrate on major historical attractions, some I’d visited previously on my own. His narrative provided more insight and taught me about African ethnic culture in Mozambique – the subject of a separate blog post to follow soon. Despite ethnic and linguistic differences, “there is little conflict among the various groups”. Hendy and I met at Hotel Pestana Rovuma’s café near Independence Square, and our first stop was Nossa Senhorha da Conceicao (Our Lady of Conception). 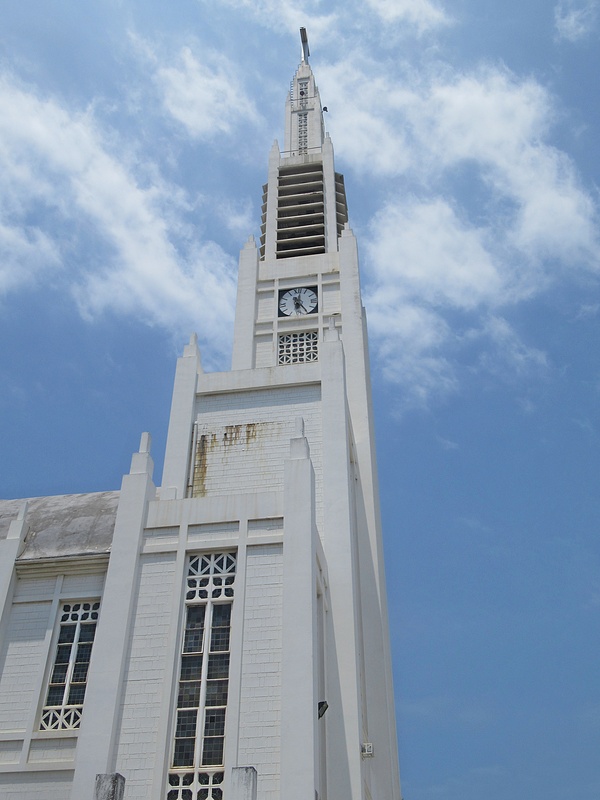 The beautiful Roman Catholic Cathedral is a well-known landmark in Maputo with a tall single spire and stained-glass interior. Portuguese architect Marcial Simões de Freitas e Costa built the cathedral in 1944. There was a large funeral gathering at the cathedral with government cars parked outside. I didn’t think it appropriate to walk inside but will return later to see the interior artwork and stained glass. Across the street from the cathedral we visited City Hall, a French “Beau-Arts” building. The architects were Carlos Cesar do Santos, Franz Keindl, and Arnaldo Pacheco Pereira Leite. 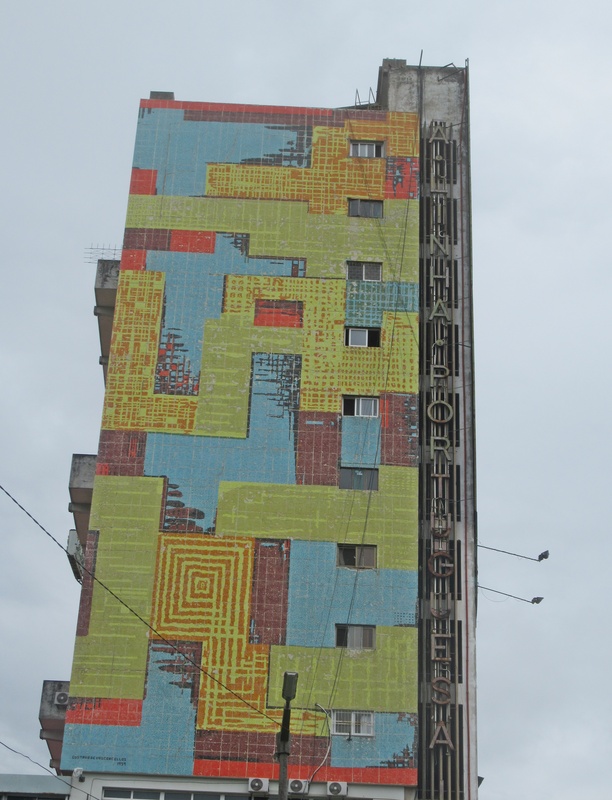 Completed in 1947, the words of the former President of the Portuguese Republic Americo Tomas – “Aqui e Portugal” (This is Portugal) – were inscribed on the building but removed after Mozambique’s independence. 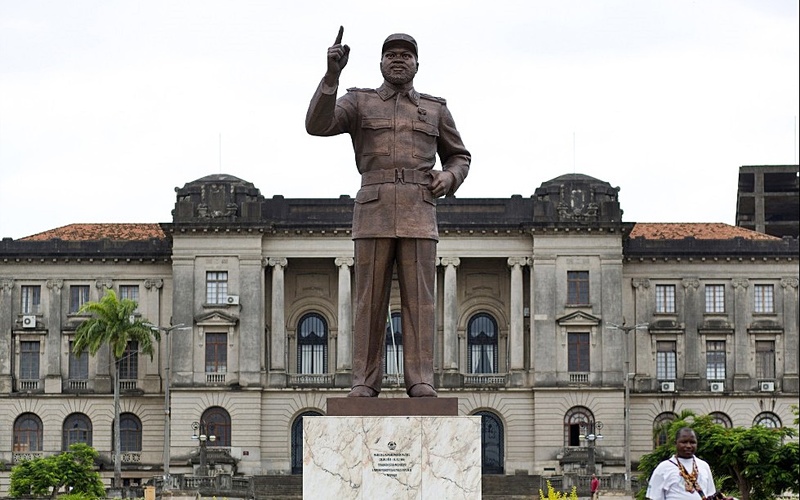 An imposing Statue of Samora Machel – 30 ft. tall weighing 4.8 tons – dominates Independence Square. Machel was a follower of Eduardo Chivambo Mondlane, the assassinated leader and founder of The Mozambique Liberation Front (FRELIMO). During the 1960s, he spent time with Mondlane in Tanzania where FRELIMO was founded. Machel was Mozambique’s first President from 1975 to 1986. He died in an air crash in South Africa under suspicious circumstances. His statue was “designed and constructed in North Korea by the Mansudae Overseas Projects, an arm of the Mansudae Art Studio“. His widow, Graça Machel, later married South African President Nelson Mandela. She’s an international advocate for women’s and children’s rights. In 1997 she became a British dame for her humanitarian work and now lives in Maputo. Graça Machel is the only woman in history to have been first lady of two separate republics, serving as the First Lady of Mozambique from 1975 to 1986 and the First Lady of South Africa from 1998 to 1999. Built by the Portuguese, after Mozambique gained independence in 1975, the square’s name changed to Praça da Independência. 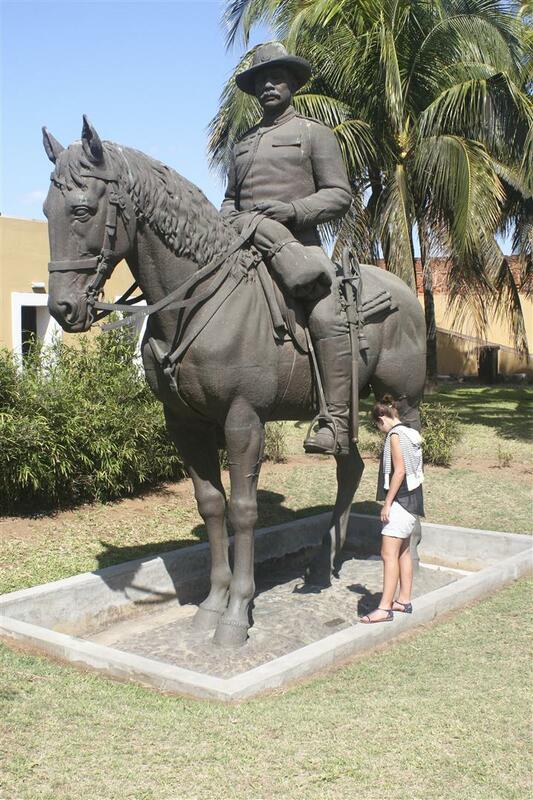 Samora Machel’s statue replaced Portuguese cavalry officer Joaquim Augusto Mouzinho de Albuquerque. 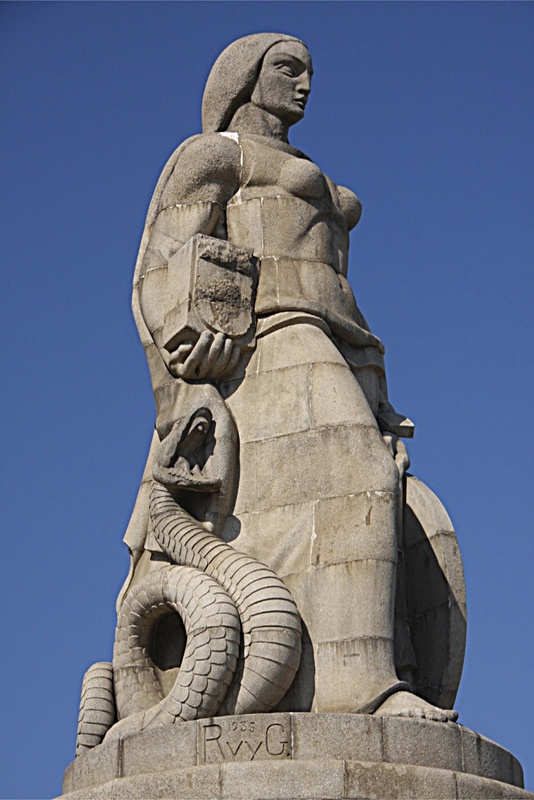 Albuquerque’s statue was moved to the old fort with other remnants from the era of Portuguese rule. We passed the Iron House near the botanical gardens and designed by an associate of Gustave Eiffel in the late 19th century. Intended to be the governor’s residence, the house’s metal-plated exterior was unsuitable for tropical weather. Inside there was a display of interesting pieces by local artists – all made from bullets and remnants of Mozambique’s civil war. I’ve visited Tunduru Botanical Gardens a few times to escape the heat and busy city streets. Trees and plants in the park are a magnificent haven. Hendy pointed out a colony of fruit bats that made the park their home. You can see them literally hanging in the trees. On the way to the fort we passed interesting architecture including the Avenida Buildings which burnt down in 1990 and were never restored. In a prime central location, they were constructed in the 1900s for Gerard Pott, a South African and Honorary Consul of Transvaal. 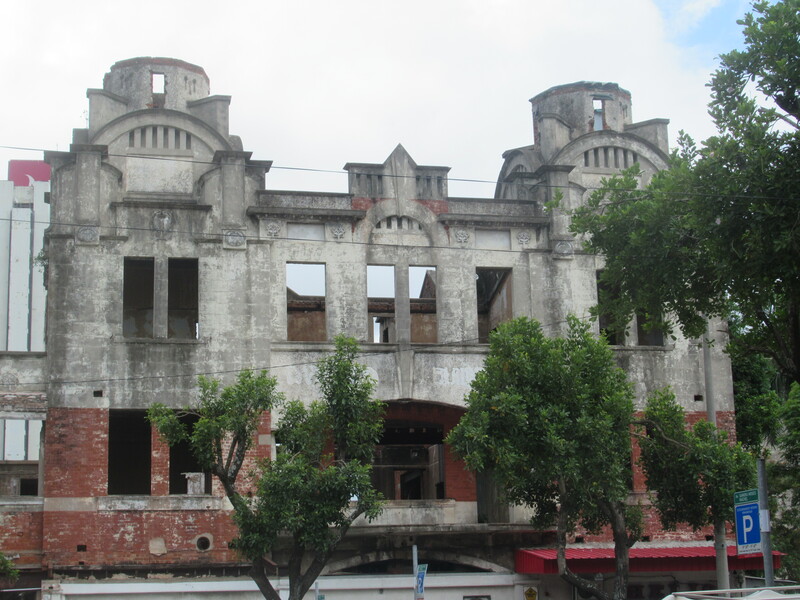 Another interesting building that has seen better days is the TAP (Portuguese National Airline) or Montepio (Portuguese Savings Bank) building. There’s a colorful abstract mosaic painted on the façade. It’s had many uses and now is an apartment building. 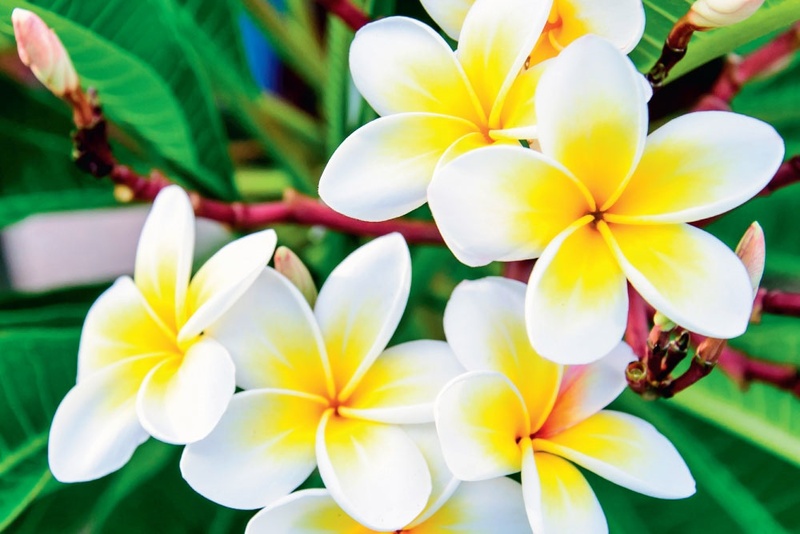 We continued to restored Fortaleza da Nossa Senhora da Conceicao, the Portuguese fort built it in the mid-19th century and surrounded by fragrant frangipani trees. 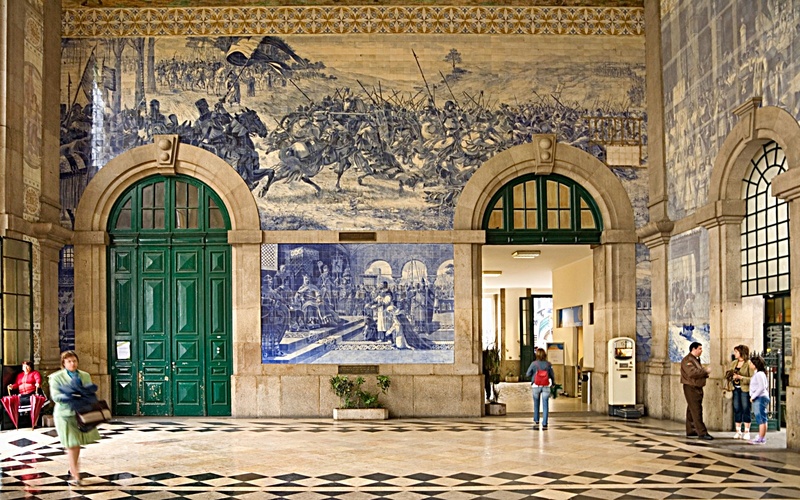 The fort’s museum houses “remnants from the era of early Portuguese forays to the area”. The sealed, carved wooden coffin of King Ngungunhane – “final ruler of the famed kingdom of Gaza” – is on display in one of the side rooms. 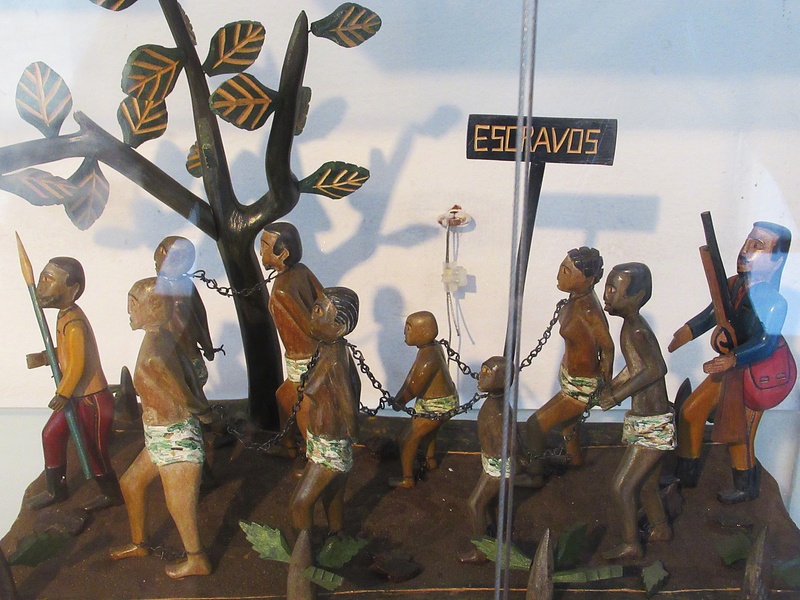 In another area of the museum, local Mozambican artists and master wood carvers crafted beautiful detailed wooden carvings. They depict scenes from Vasco da Gama’s arrival in 1498 and the Portuguese take over up until Mozambique’s independence in 1975. The hard-fought battle for independence was fierce and brutal. Africans fought on foot using primitive weapons, while the Portuguese had horses and guns! We ended the tour at CFM Railway Station. The beautiful Victorian building was designed in 1920 by an associate of Gustave Eiffel. 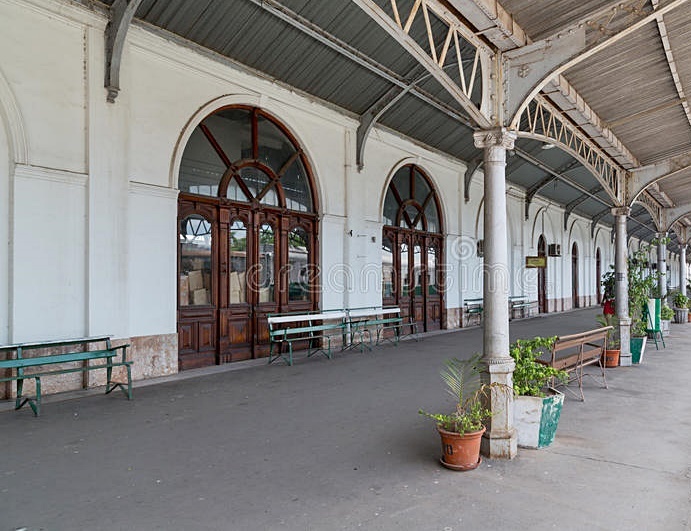 It has a wrought iron roof dome and marble pillars and is considered one the most beautiful train stations in the world. A Monument to the Great War stands in front of the CFM station. 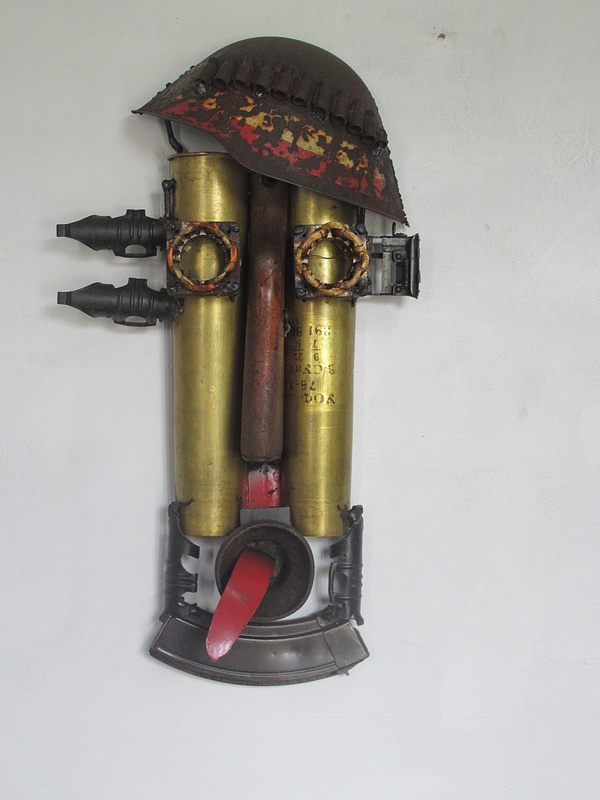 It represents the “efforts of the Portuguese and Mozambicans in the World War I”. The statue is considered a Portuguese memorial “representing Portuguese sacrifices repelling the German invasion of northern Mozambique”. Portugal “conscripted thousands of Mozambican men to fight for the Allies”. 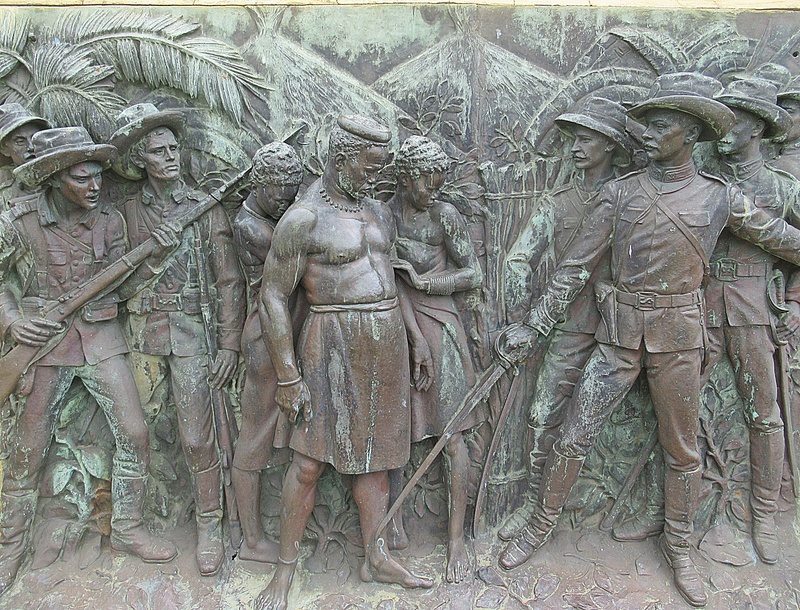 “More than 130,000 Mozambicans died in the war,” resulting in an uprising in 1917. After Mozambique gained independence in 1975, the Minister of Transportation wanted to destroy the Monument, but the “multi-ton hunk of steel-reinforced concrete made that difficult”. 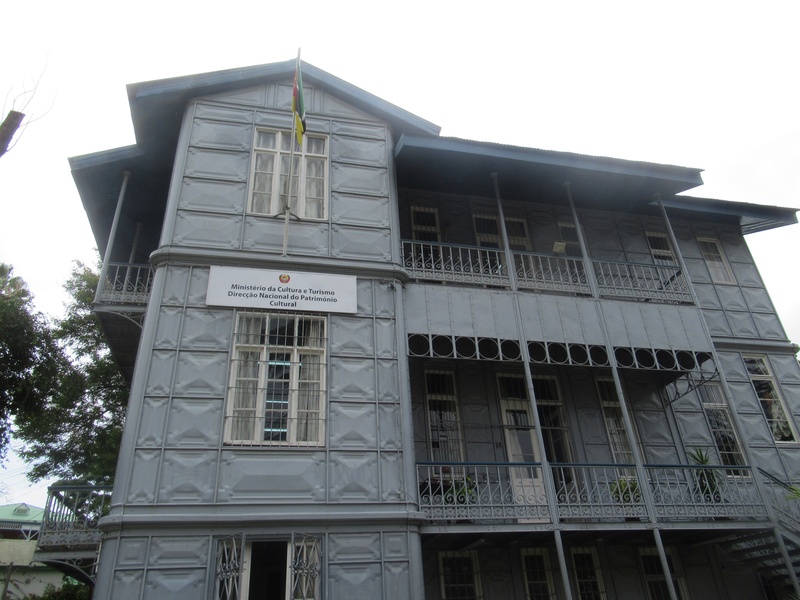 Today it remains as a somewhat neglected monument to Mozambique’s “territorial integrity”. After visiting the station, I thought about taking the train from Maputo to Cape Town in March. When talking with several locals, I realized it would be a long, uncomfortable trip. With frequent stops, it could take up to 7+ days. I’ll fly instead. 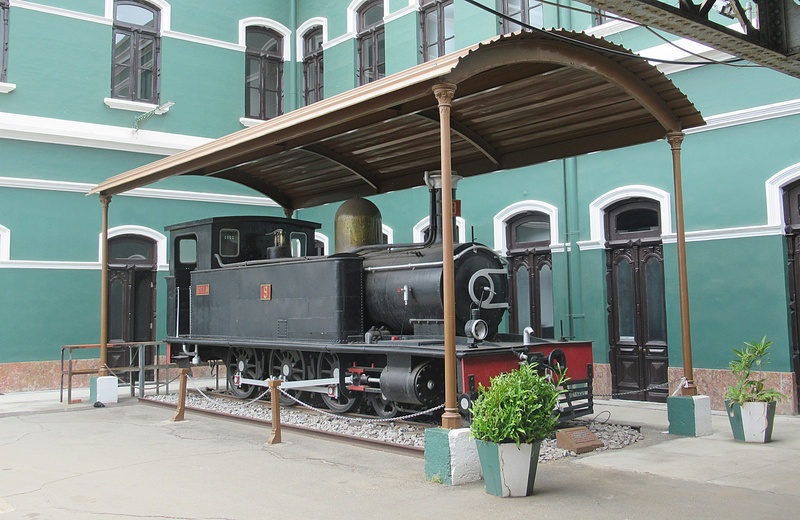 This central tour merely scratched the surface of the many interesting buildings in Maputo – each with its own unique story. Another favorite is Cine África on Avenida 24 de Julho. 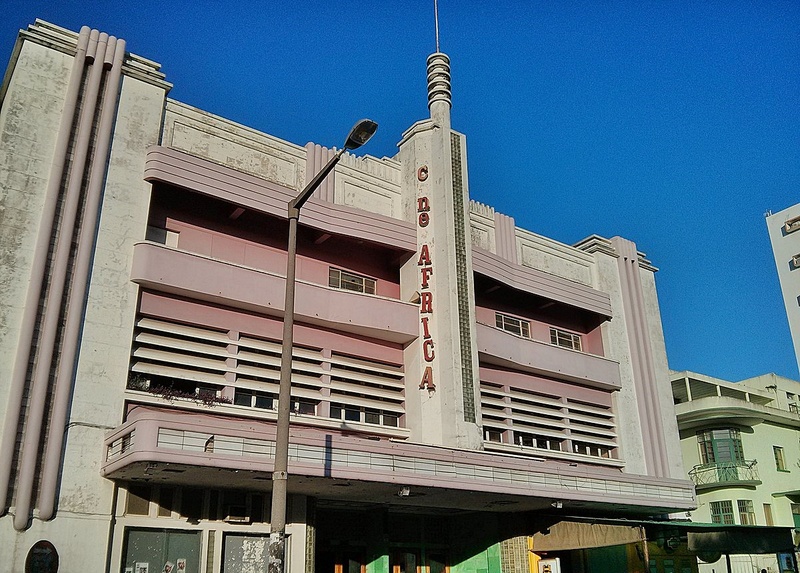 The beautiful Art Deco building was once a theatre that “disseminated films produced in Africa,” but it’s now closed. Some of Mozambique’s nature reserves are closed from November through March for the rainy season. I’m planning a snorkeling trip to Inhaca island in Maputo Bay and perhaps Ponta do Ouro. Inhaca is a marine research center known for remarkable coral reefs. Ponta do Ouro is a popular area near the South African border. Getting to both locations can be complicated and involves ferries and booking in advance. This entry was posted in Africa, Mozambique and tagged American Cultural Center and American Corners in Mozambique, Arnaldo Pacheco Pereira Leite, Avenida Buildings Maputo, Beau Arts, Carlos Cesar do Santos, Center Culturel Franco-Mozambicain à Maputo, CFM Railway Station, Chopi, Cine África, Club of Mozambique, Eduardo Chivambo Mondlane, Fortaleza da Nossa Senhora da Conceicao, Frangipani Trees, Franz Keindl, Gerard Pott, Graça Machel, Graça Machel British Dame, Gustave Eiffel, Hotel Pestana Rovuma, http://www.historyworld.net/wrldhis/PlainTextHistories.asp?historyid=ad29, Inaca Statue Portuguese Monument to the Great War, Inhaca Island, Island Mozambique, Jardim Tunduru Botanical Gardens, Kingdom of Gaza, Maconde, Makua, Mansudae Art Studio North Korea, Mansudae Overseas Projects Noth Korea, Maputo, Maputo a Pé, Maputo Bay, Maputo Free Walking Tour, Maputo Municipal Council Building, Marcial Simões de Freitas e Costa, Mestiço, Montepio, Mozambique, Ndau, Ngoni, Nossa Senhorha da Conceicao, Our Lady of Conception, Phillip Schauer Maputo Architectural and Tourist Guide, Ponta do Ouro, Portuguese East Africa, President Americo Tomas, Sena, Shangaan, Shona, Statue of Samora Machel Independence Square, Swahili, TAP (Portuguese National Airline), Tonga, Tsonga, Yao, Zambezi Valley by suemtravels. Bookmark the permalink. I love that you are so adventurous and bring us these wonderful insights into unusual travel destinations.